When we were decorating our first son’s nursery, we poured through magazine after magazine for ideas. One of the things I loved was the idea of a personalized name decoration. I’ve always been nuts about personalized items for myself, and something about having his name on the wall just made it feel so much more real and special. We did have two problems, though. First, our son’s name, Kyan, is unusual, so finding one that was already made in a craft store was nothing short of impossible. Secondly, personalized anything is super expensive, and with everything else a baby actually needs, dropping $30 on a personalized decoration wasn’t exactly practical. Also, by way of budget and practicality, we knew that if we paid for one for our first son, we’d have to do the same for any other children we might have. So, since we didn’t have the dough to have a personalized nursery decoration custom-made, we decided to get crafty and make one ourselves. I went to the local hardware store and found some basic wooden letters. Just about every hardware or craft store has them for a buck or two a piece. I also picked up a few small jars of paint (one for a base color and then a couple to decorate with). 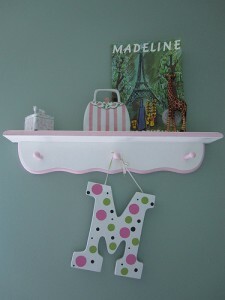 I also bought a spool of fun ribbon to hang the letters with. When I got home, I painted each letter a simple pale yellow and allowed it to dry. If you’d like more variety, you can paint each letter differently. Then after the paint was dry, I went back and painted designs on each letter. When everything was completely dry, I used a hot glue gun to attach a loop of ribbon on each letter to hang it. It turned out super cute and I paid less then $10 for the whole project. If you’re not wanting to go through the painting process, there are a lot of other fun options. If you use your imagination, there are endless possibilities for the perfect personalized baby name decoration for your little cherub’s nursery. Fantastic! I’ve used glitter, ribbons, and rhinestones for decorating but have not yet done a personalized name decoration. I love this! So many people forget about the fun, crafty ways they can inexpensively make those things they find elsewhere. With my name, it’s impossible to find anything with my name on it, either.